Yesterday I went up the Tokyo Sky Tree. 634 meters tall … the tallest tower in the world! First of all, the elevators move at 600 meters per minute! But they’re so smooth, I could hardly feel them move! The sky was clear, blue and sunny … so I could clearly see Mt. 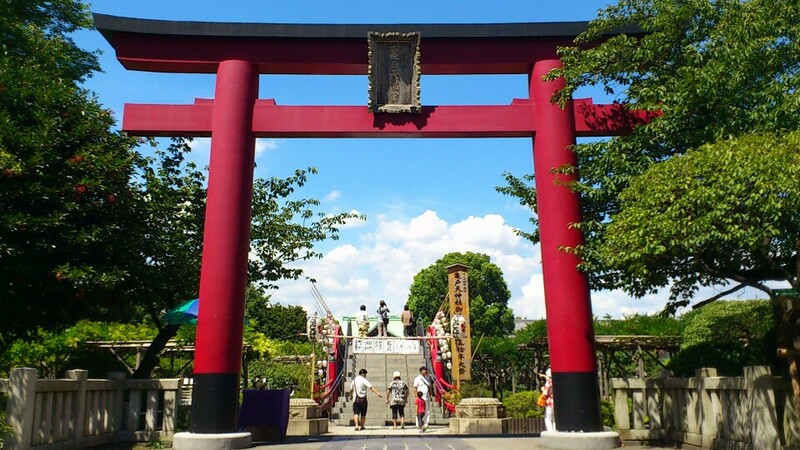 Fuji, Tokyo Tower, Shinjuku, Tokyo Disneyland, the Tokyo Dome…all of Tokyo and beyond! 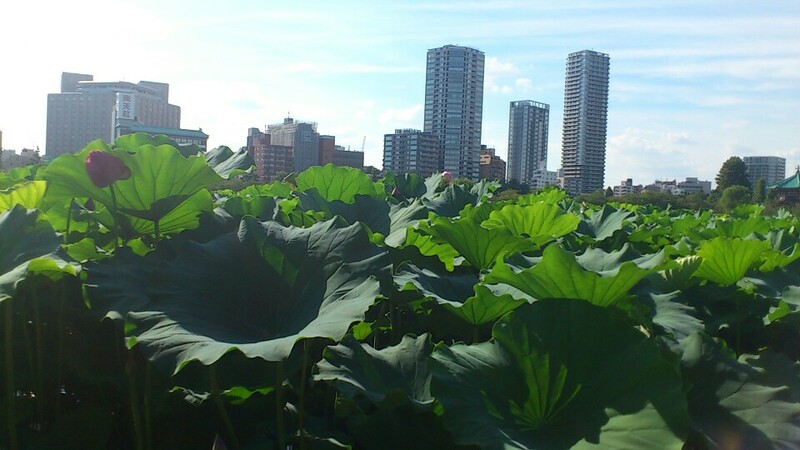 Summer in Tokyo is very hot and humid. There is a typhoon season and sometimes a sudden thunderstorm with heavy rain will start seemingly out of nowhere…and then stop just as suddenly with blue skies returning. Japanese people are sometimes surprised if I tell them that summer in Florida (where I grew up) is very similar. Summer in Florida is also hot and humid. There is a hurricane season (hurricanes, for all intents and purposes, are basically the same as typhoons) and sometimes sudden short thunderstorms occur there too. In fact, the area in Florida where I lived, Tampa Bay, is called “the lightning capital of the world”. When the weather is sunny and then a rainstorm suddenly starts…with the sunny weather returning just as suddenly, Floridians call that a sun shower. 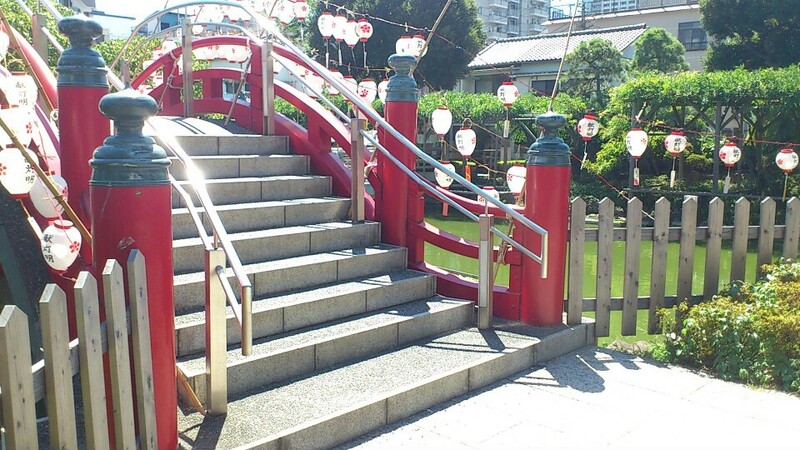 So I also referred to the same phenomenon in Japan as a sun shower, as well. But a few years ago, the Japanese media gave these storms an original Japanese name. Here in Japan, these storms are called 「ゲリラ豪雨」 (“Guerrilla rainstorms“) because of the way they violently come out of nowhere. 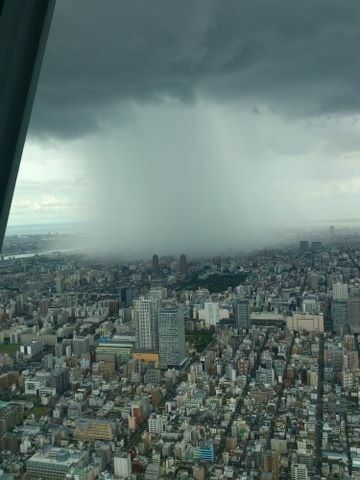 Well, yesterday, there was a sudden, short, ゲリラ豪雨 (Guerrilla rainstorm)…and someone photographed it from the Tokyo Sky Tree tower. The 「ゲリラ豪雨」 (guerrilla rainstorm) that hit the Tokyo area yesterday. It looks like a tornado! 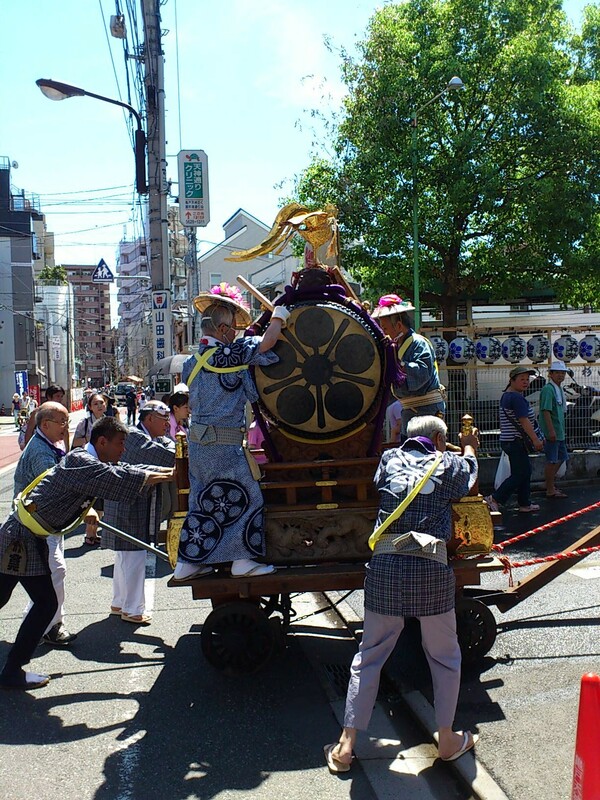 Earlier this month, I participated in one of Tokyo’s biggest festivals. There are many great festivals all year round…but especially so in the summer. 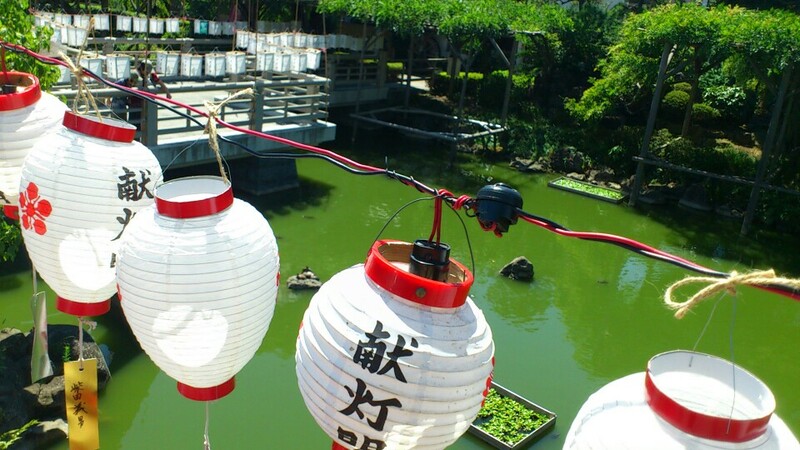 I like Japan’s festivals a lot…and I go to many of them. 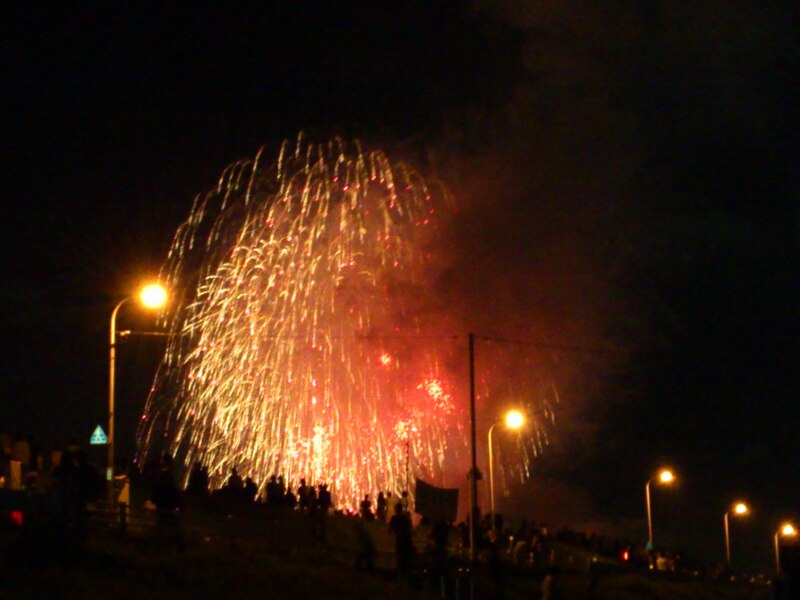 In early August, my family and I went to watch a summer 花火大会 (fireworks show) near our house that we usually go to every year. 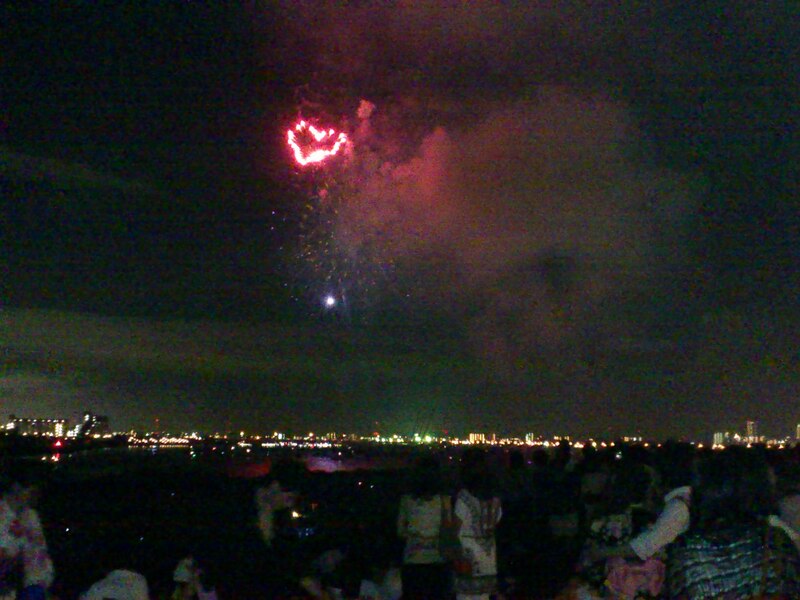 The 花火大会 (fireworks shows) in Japan are excellent! If you have a chance, you should see one! 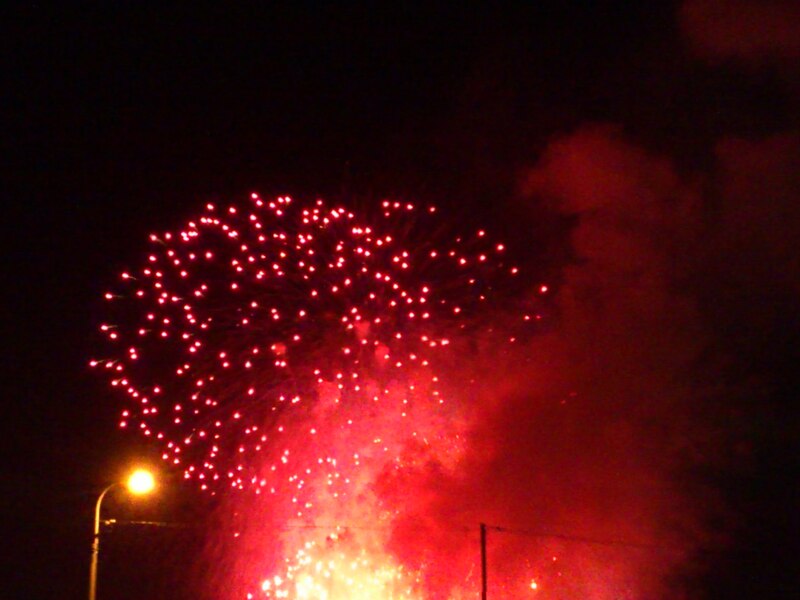 花火 (“hanabi”)…literally “flower (of) fire”, is the Japanese word for “fireworks”. 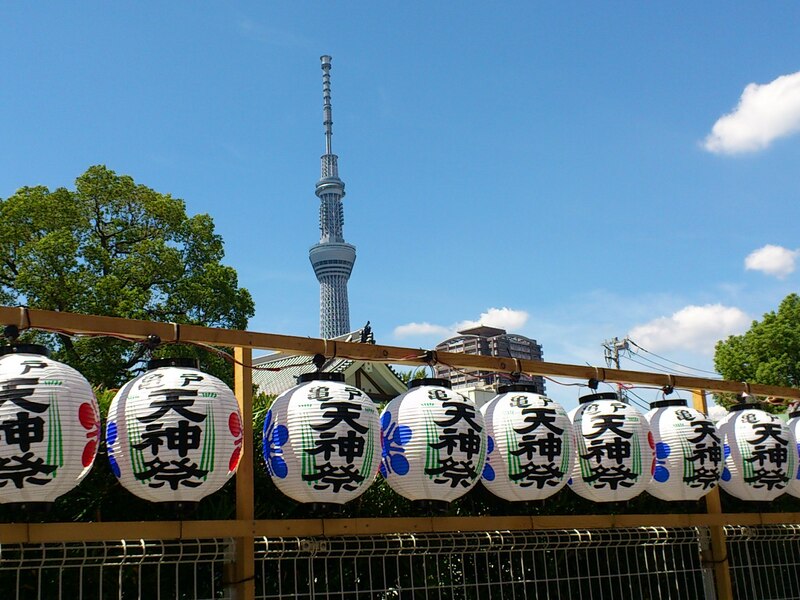 We also went to a festival at a temple not far from the Tokyo Sky Tree. 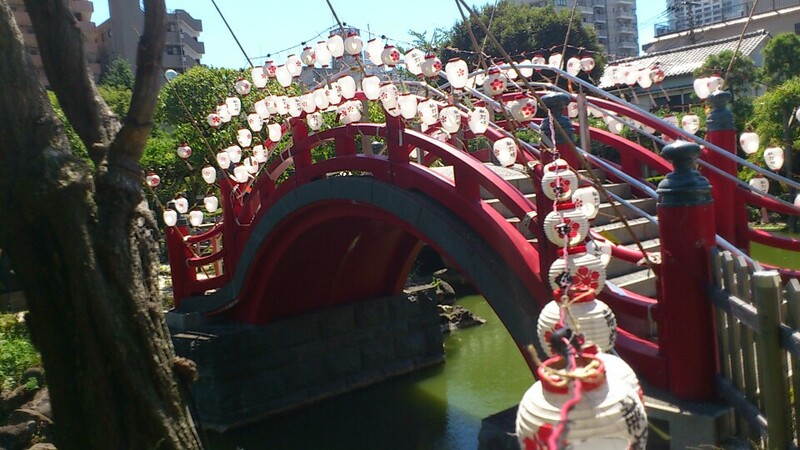 If you have any questions about festivals in Tokyo, things to do in this city, or whatever…feel free to contact me. 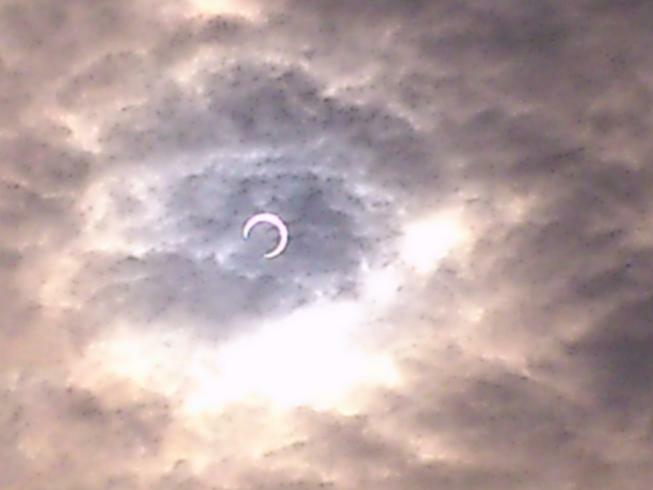 Yesterday a 日食 (solar eclipse) could be seen over Tokyo and a few other parts of the world. Did you watch the eclipse? To look at it, you needed to wear special glasses otherwise you could risk serious eye damage. I got a (cheap) pair of the glasses and watched the eclipse. It was visible in Tokyo at 7:30AM. I took a few photos of it with my cell-phone camera. Unfortunately, I wasn’t able to get a very good shot of the “ring of fire” (when the moon was directly in front of the sun and a perfect ring was visible around the dark moon)…this one is probably the best of the pictures I got. 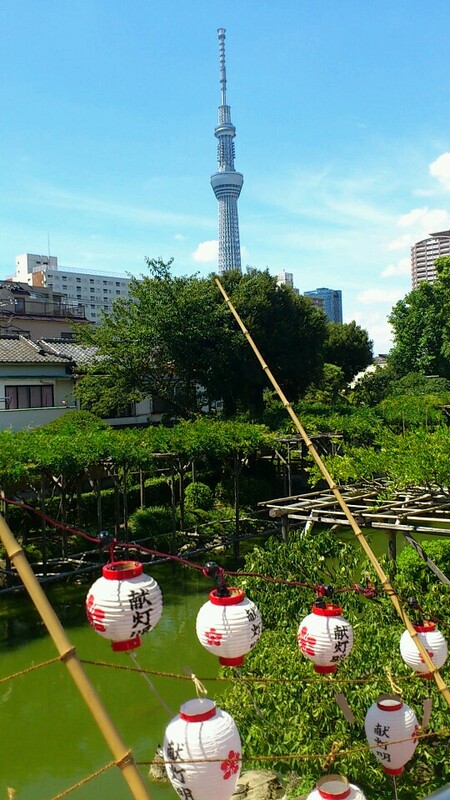 Another “sky-related” event in Tokyo is the grand opening of the Tokyo Sky Tree today (2012 May 22). Personally, I don’t plan to go inside the Tokyo Sky Tree at least until the “novelty” wears off because it’s going to be very crowded (for awhile, a reservation is required to go inside) and also, the admission cost is expensive—¥2,000 – ¥3,000 for adults (depending on which level of the tower you want to go up to).